A team of scientists from the University of Washington has published a new study concluding that the deadliest landslide in US history, which killed more than 40 people in Oso, Washington, was not a fluke. In fact, they estimated that over the past 2,000 years, the same stretch of valley has been slammed by a major slide every 140 years, on average. After the disaster occurred in March 22, 2014, geologists reviewed maps of the area based on a laser scanning technique called lidar. By stripping away vegetation, the lidar revealed tracks left by large, past landslides up and down the valley. However, it was impossible to tell how long ago those slides occurred. The torrent of mud released by the slide roared over both stream banks of the Stillaguamish river and across state Highway 530, flattening more than two dozen homes on the outskirts of the town of Oso in the foothills of the Cascade Mountains. Photo: Associated Press. Geologist from the UW and co-author Alison Duvall, knowing that a big question on everyone’s mind was how rare an event like Oso was, explained that if it were actually as ancient as people believe, then the sliding of Oso would only be part of a natural phenomena, ceasing to be a representative present threat. 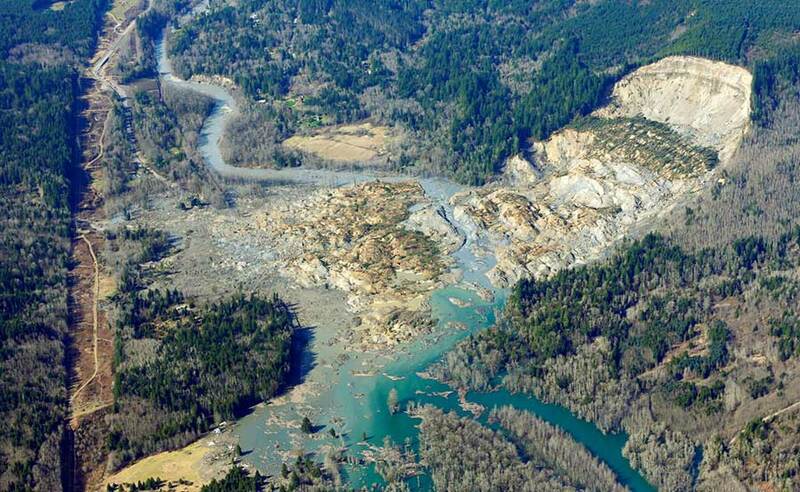 The researchers decided to answer this question by determining the dates of more than two dozen major landslides along a stretch of 3.7-miles (6-kilometers) of river centered on the Oso site. The researchers behind this study concluded – through a method of radiocarbon dating to woody debris that had been buried – that unlike what is believed the final collapse, which happened thousands of years ago, a massive landslide actually occurred about 500 years ago. To get to the landslide deposits, they had to wade the river in several places. Then they hiked up and down the slopes, looking for preserved branches or tree that could be used for radiocarbon dating. The team managed to unearth samples of wood buried in a huge landslide just downstream from the Oso site, called the Rowan slide, which was approximately five times as big as Oso’s and sent massive amounts of mud, trees and rocks racing across the valley, just 500 years ago. Previous studies showed that slides even bigger than Oso have occurred in historic times. But while the position of past slides and degree of surface erosion can show the order in which older slides happened, it has not been possible to give a date for the past events. The scientists were able to find datable bits of wood only on a handful of landslides. To estimate the timing of other events, they relied on the fact that slide deposits get smoother as they age. Using lidar images, the scientists zoomed in on old slides and quantified how rough their surfaces were. Then they compared slides of known ages to slides of unknown ages to come up with an approximate scale. “It can provide some information about how often these events recur, which is the first step toward a regional risk analysis,” he added. The lidar images used for the study could only differentiate major landslides, so the rate of recurrence of 140 years doesn’t take into account smaller events that sloughed off the Oso hillside throughout the past century. It’s not known whether the findings for the Oso site’s history would apply to other parts of the Stillaguamish River, Duvall said, or to other places in Washington state. The researchers are still studying debris from other locations, but the results do have implications for the immediate area.